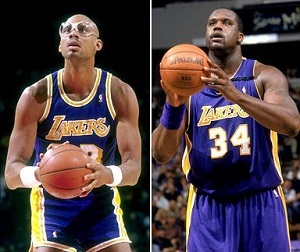 Kareem (left) and Shaq have 10 NBA titles between them. Contrary to what some people believe, Muslim is not a racial group, and Islam is not wholly represented by one organization — be it honorable, deplorable, or otherwise. Therefore, it’s not always easy to identify those individuals who aspire to walk the Straight Path by submitting their lives to the will of Allah [swt]. It is especially tough when it comes to celebrities, whose personal lives and lifestyle choices are presented to the public in an indecipherable mix of truth, lies and rumors. And because many celebrities try to keep as much of their private lives private as possible, they may not be forthcoming with confirmations or denials about that which is reported about them. While some celebrities like boxing legend Muhammad Ali and Rock and Roll Hall of Fame musician Yusuf Islam leave no doubt about their religion, there are others — Janet Jackson, Ice Cube and Casey Kasem among them — who have been rightly or wrongly associated with Islam through nothing more than rumors, hearsay and assumptions. Meanwhile, I think the Muslim community is often quick to declare whether someone is or isn’t a Muslim based on that person’s actions. If someone is drinking, or fornicating, or not dressing modestly enough, some Muslims will question that person’s faith. But from what I understand, being a Muslim is always about what you believe, and not always what you do. By that, I mean that committing acts that are haram, or neglecting prayer, or failing to live up to the expectations of being Muslim … while they will put you at odds with what Islam teaches, they do not mean you’re disqualified from being a Muslim, as long as you are still a believer in the basic tents of Islam. Extreme case in point: Members of criminal organizations like ISIS and Boko Haram. While Muslims all over the world have been unfairly tasked with answering for the actions of these groups, all we can accurately say is that their actions and ideals do not represent Islam and their actions and ideals are not supported by the Quran; we cannot definitively say that ISIS and Boko Haram members are not Muslim, because we don’t know what they believe. They may be the worst, most misguided Muslims in the world — but if they believe in the tenets, they’re still Muslims. In a recent article for the Nigerian publication Pulse, author Oge Okonkwo lists six celebrities who are, as far as we know, Muslims who take their faith seriously via acts of charity and philanthropy. Shaquille O’Neal: Shaquille O’Neal is known for his unbelievably successful NBA career, his success as a sports broadcaster and graduating with his doctorate. Many may not know that O’Neal works very closely with two charities – O’Positive Foundation and Green My Parents (GMP). The O’Positive Foundation focus on the needs of children and helps impoverished families get the education and necessities that they need to make it. While Green My Parents is an organization developed around the environmental economic movement. GMP focuses on the importance of a healthy environment, energy consumption and how to engage children and parents into making eco-responsible changes within their homes and lifestyles. While Abdul-Jabbar is very open about his faith has been accepted by mainstream media outlets as an international ambassador for Islam, Tyson and Shaq are more complicated cases. Both are often subjects of the “are they or aren’t they” debates among Muslims and non-Muslims about their religion. Shaq has said in interviews that he is Muslim — and then in the same breath he’ll add that he’s also Buddhist and Baptist and Jewish because he’s a “people person.” Shaq has talked about making the hajj pilgrimage, and the stepfather who raised him is reportedly Muslim. But because he openly dates women, or because he performs hip-hop music that isn’t exactly halal, for example, many would argue that Shaq is not Muslim. Tyson revealed that he’d converted to Islam while serving a prison sentence in the 1990s, and has been seen wearing kufis and visiting mosques. But some of his other behaviors since getting out of jail — drug abuse, alcohol abuse, abuse of other people, general vulgarity, etc. — make it so many Muslims wouldn’t “claim” Tyson as one of our own. The way I look at it, while only Allah [swt] knows what a person believes in their heart, we should lean toward believing and supporting anyone who says they are Muslim. We should strive to give the benefit of the doubt that their intentions are pure. And that does not mean supporting or encouraging haram actions or harmful decisions. Instead, it means trying to welcome them into the Muslim community while encouraging them to make healthy decisions and follow the right path.